Packaging equipment for fasteners, metal hardware and parts. Packaging equipment for metal hardware and parts. 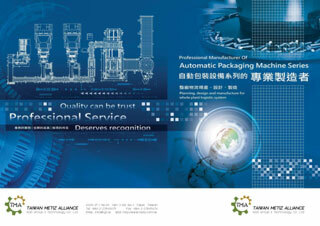 General information on packaging machines for metal hardware and parts. The technological process of automated cartoning. Packaging Line. Wrapping equipment. Technological process of packaging wrapping. Packaging of the Equipment. Lines automatic packing fasteners. Tipping-loading equipment. Molding equipment. Marking equipment. Automated transport system. Automated storage. Taiwan equipment on Global market. Taiwan Metiz Alliance is engaged in design and manufacture of automated lines for packing screws, nuts, studs, steel and iron nails, rivets and other fasteners "turnkey". Today, thanks to the efforts, experience and professional skills, the company has received many patents for its products. The company's specialists are constantly engaged in innovation and development of new products. At the same time, the company is investing a lot of money and put a lot of time designing and developing numerical control, computer integration and the creation of user-friendly operator interface to meet modern technical requirements.